Guacamole is so simple that a recipe is hardly necessary, but if there’s a recipe you have to have, it’s for the classic Guacamole. The only key thing to know is your avocados have to be perfect or your Guac will suffer. Check out this page from Avocado Central. Other than that, you’ll have to decide: Cilantro or no Cilantro! If ever there’s an herb that causes issues, Cilantro has got to be it. People have very strong feelings about it. I mean it separates friends & divides families! See when Cilantro “bolts” or grows quickly in heat and gets ready to seed, the flavor of cilantro really changes. Those with sensitive palettes pick up on a strong soapy taste. I’m one of those, so I sprinkle a little cilantro over the top (so it can be removed) or pass some on the side. Problem solved. Boom. The other Guacamole divider is the heat. Guac isn’t typically hot, but it’s nice to have some interest. Honestly, sometimes when I make Guacamole, I just shortcut and add a little Pico de Gallo. Other times I add in all kind of things. Bacon, pepitas, tomatoes. Whatever inspires me. 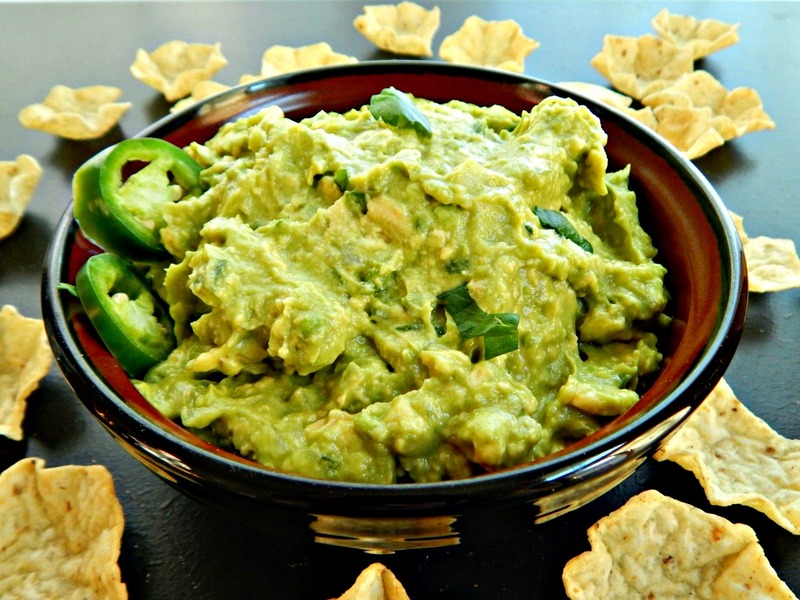 For this classic guacamole, I just use a hint of Serrano or jalapeno pepper and a little onion. And of course, some lime. Always look for Avocados on sale – if you’re lucky, your grocer may bag avocados that are just about ready but haven’t sold & you can get them cheaply – if not, when they are on sale, you can pick some that are very firm to last into the next week or some that are almost ready to use right away. You’ll always want to buy avocados a little ahead if you’re planning to serve them on a certain date. A hard green one will take about five days to ripen. Store in a paper bag with a banana to speed it up a bit and a ripe one can be held in the fridge for a day or two. That stem trick you’ve probably seen? Nonsense. So there you go: Go forth and Guac! And always feel free to add in your fave additions! In a medium bowl, smash avocados with a potato masher or fork in a medium bowl until coarsely mashed. Mix in onion, chile, garlic, lime juice, salt, and ¼ cup cilantro, if using. Taste and add more salt or lime juice, if desired. Of course I’ll be bringing these tacos to Fiesta Friday, hosted this week by Monika @ Everyday Healthy Recipes and Sue @ Birgerbird. I’ve already seen all kinds of wonderful Mexican & Southwestern food there this week in honor of Cinco de Mayo. This entry was posted in Click here for Fabulous Food Posts and tagged Appetizer, Avocado, guacamole, Hot Peppers, Lime, Mexican or Southwestern, Spreads and Dips. Bookmark the permalink. I need to make this. I love guacamole! I’ll come back and comment if I do. I just bought an herb garden today! Yay!! Oooh, how fun!! I’ve been looking around for the herbs I like to plant – we have so many garden centers open but the herbs seem to get so picked over. I need my basil, lol!! There is an Exotic plant warehouse near me that sells everything. They had 8 kinds of mint-choc, grapefruit, peppermint, orange, Mojito and others. I never knew there was more than one kind. Wow! I did know there were several kinds, but I was thinking spearmint, catnip, and so on! Chocolate mint! Hah!! How marvelous! Looks so fresh, thanks for sharing! I had to go look up CHipotle’s recipe. I gotta say I love Chipotle! That looks fantastic, too. Thanks! It really popped against that red dish! They’re so gorgeous and wonderful and can be a little pricey, so they’re somewhat precious in our house…and once cut, it’s hard to do anything with them when they’re not ripe enough. I love a good guac. Like you, I generally just add what I feel like, but it is nice to have a tried and true recipe! Thanks, I’d love to see it! I am nuts about guacamole! Oh that guac on your posts looks amazing! Thank you so much! Glad you stopped by, and glad I found your blog, too.